Based upon the true story of 70's FBI undercover agent Joe Pistone, aka Donnie Brasco, this film draws the viewer into an world of deals and deceits where it's sometimes hard to tell the good guys from the bad. Donnie becomes so deeply involved with the gangster he has been sent to destroy that he begins to find his loyalties becoming divided. Posing as the "jewel man" Donnie Brasco, Pistone (Johnny Depp) works his way into the confidence of Lefty Ruggiero (Al Pacino). This is his first move toward opening a bigger space for himself inside the Bonanno operations and, ultimately, breaking open their activities. A man motivated by a mission, Brasco discovers his first score to be a man who is unexpectedly vulnerable behind a hard reputation and tough exterior. The deeper Donnie becomes involved with Lefty and the longer he knows him, the more intricate their relationship becomes. Lefty gives Donnie his start by vouching for him and so begins their partnership. Donnie's loyalty to the mob and dedication to their activities established, he embarks upon a path to darkness where he lives on such a fine line that it becomes almost impossible to distinguish between federal agent and criminal at times. This line becomes vaguer as his deeds become more violent and his attachment to the mob strengthens. The more time he spends with the mob family, the less he spends with his wife and kids. The secrecy and danger that enshrouds him begins to take its toll both on his mind and home. While dealing with these problems, he is painfully aware that his work could easily, when brought to its final and logical conclusion, result in a death sentence for Lefty. Pacino plays the disappointed washed-up two-bit gangster whose heyday has passed and left behind little more than a man who resorts to cracking open parking meters for loose change. His ironic portrait is sometimes touching, sometimes sad, with an undertone of a suppressed, but extremely volatile nature that, though rarely apparent, could unexpectedly erupt at any moment. Depp is equally sensitive in his portrayal of a man falling down a chasm from which he might never be retrieved. It's wonderful to watch Johnny Depp play opposite Pacino, both on an equal footing. Depp is so adept at donning the characters he plays that the untrained eye might easily miss the wonders he works. Even the real life Joe Pistone, who was assisting on location with his wife during filming, admitted that J.D. had acquired his movements, attitudes, way of talking and even his own walk. (Pistone, who still has a \$ 500,000 price on his head, lives today under a new identity). This film is the one to shake those disbelievers awake who have not yet accepted or understood the maverick talent on view in such memorable films as Edward Scissorhands, Ed Wood, Cry Baby, Dead Man, and, of course, What's Eating Gilbert Grape? He has always been clever enough to make intelligent decisions about which roles to accept by basing them upon a good script. Depp has reached the top, although it was obvious quite a long time ago that his spot there was reserved. How ironic that a role with certain similarities to his original attention catching part in the TV series 21 Jump Street should prove so pivotal to unequivocally establishing his place for any remaining doubting Thomases. See, you sceptics, he's not just another pretty face. 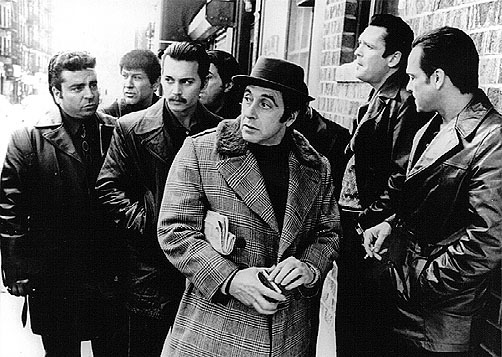 Scriptwriter Paul Attanasio (Quiz Show, Disclosure) has done a fine job adapting Joe Pistone's book Donnie Brasco, My Undercover Life in the Mafia for the screen. What places this film above the run-of-the-mill gangster film is the definition of the main characters and the intricacy of their personal involvements with each other. It becomes an intimate portrait of friendship and fidelity while maintaining a suitable distance from the predictable banalities often associated with the contemporary gangster film. In other words, "fuggedaboudit" (if you know what I mean). Superb points for director Mike Newell who adds a few more funerals to his list this time around. A native of England, he spent some time getting the feel of the real location: "I spent some time in Brooklyn where these guys are still running the same kind of businesses they always have: gambling and loan sharking and so on. I would go out on the weekends, drink and eat with them and hang around in their social clubs. Obviously, there was a lot they wouldn't show me, but I saw as much as I could. It was like being let into the heart of the tribe. They were very generous to me and I became very fond of them, so I had to remind myself that they also did horrendous things, that these men that I was having such a good time with were also ... well, I didn't really want to know." (Well, Mike, Brooklyn probably ain't never gonna' change much, even if the Dodgers did leave.) Superb points as well for Director of Photography Peter Sova who has framed each section of the film so beautifully and effectively that the pulse of the story seems to reach out and grab you. It's also nice to see Zelijko Ivanek back on screen once again, even if it is in a supporting role.